C. 650 BC The first coins made of electrum, a natural alloy of gold and silver, were issued in western Asia minor. Today we would call this metal white gold. 500 BC By this date, coinage of gold and silver spread across the Aegean to Greece, south to the near East, and then westward to Italy. Coins did not yet reach Britain. 336 BC Coins of Philip of Macedonia (359-336 BC) father of Alexander the Great, circulated among the Celtic peoples along the Danube. They were copied widely through Central Europe and by the Gauls in France. 294 BC The gold stater of Philip II of Macedonia was issued throughout the reigns of Alexander the Great, Philip III and Cassander, down to 294 BC. Each of these men employed large numbers of Celtic mercenaries, and their service in the Mediterranean introduced them to the use of coinage. We do not know how many staters they were paid for a season's military service. These staters show the head of Philip on one side and a two horse chariot on the other. 200 BC Gold staters from Gaul began to reach Britain. In the past this was thought to be along with the migrating Belgic peoples. 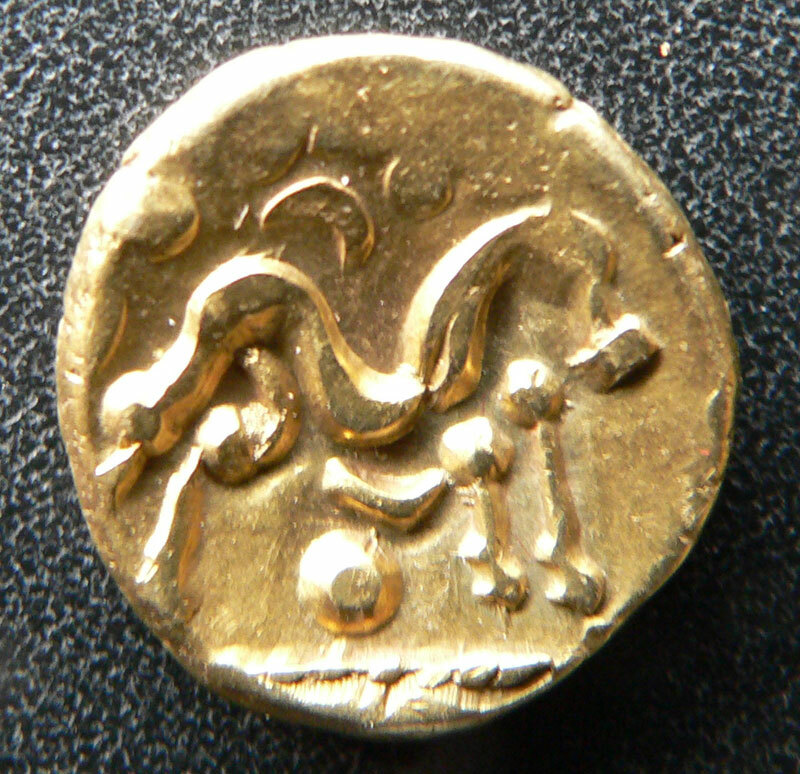 A stater is the name given to the standard Celtic gold coin. Some objects have been found in Britain which are sometimes believed to have been used as currency. Iron objects known as currency bars occur in central and southern England, but so far none are known from Suffolk or Norfolk. They are described as spit-shaped, sword-shaped, plough-share and bay leaf, and a hoard of eight bars was found in a stream near Grantchester in 1992. They may have been more for ritual purposes as votive deposits, sometimes being placed in ponds or rivers. They are about 60 centimetres long and around half a kilo in weight. They are dated from about 200 BC for the next 200 years or so. c 150 BC A succession of coins manufactured by the tribes of Northern France was imported into south-east England beginning around this time for at least a hundred years. This area of France has been called Belgica, and these coins are known to collectors as Gallo-Belgic A to F series. In the past this evidence was thought to indicate successive waves of Belgic invaders, but this is no longer widely believed. Although Caesar recorded Belgic raiders to England who may have settled there, it is now thought to indicate payments for military service, close cultural links and trading ties as well as gifts cementing political or social alliances across the Channel. 100 BC Perhaps the oldest British made coins were not made of gold, but were a series of cast bronze or "potin" issues manufactured in Kent. These appear to be based on the bronze coinage of the Greek Colony in Marseilles (Massalia). A hoard of this bronze coinage was found in Thurrock in Essex, and samples have been found in East Anglia. 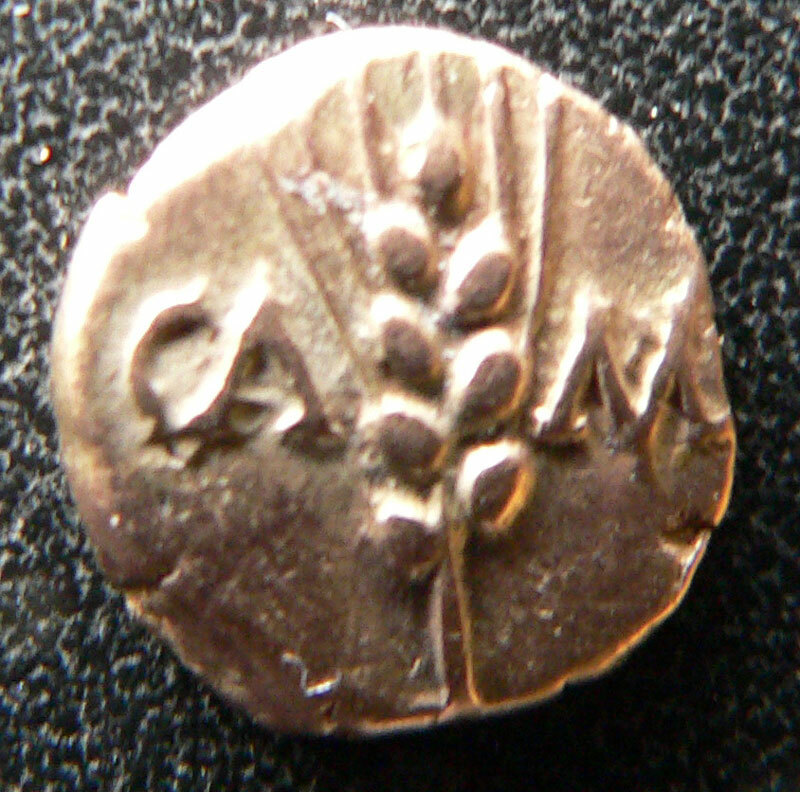 c 70 BC British made coinage was circulating by this time, but it was often just copied from Roman designs. British coins started to be produced in gold and are sometimes called British A to P. At the same time there were also quarter staters, silver units and bronze units produced. 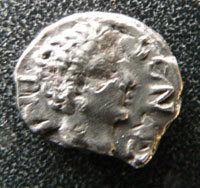 65 BC A coin known as British G has also been called the Clacton type because a hoard was discovered at Clacton in 1898. Activities by metal-detectorists in the 1990's have since discovered more of them. The Clacton stater has crescent moons and laurel leaves on one side and a celtic horse design on the other. It should be noted that the Yarmouth stater was found at Yarmouth in the Isle of Wight, not in Norfolk. 60 BC Dating from around this time is a mysterious group of Iceni coins called the Bury type or Bury Diadem type because the first examples were discovered around Bury St Edmunds. 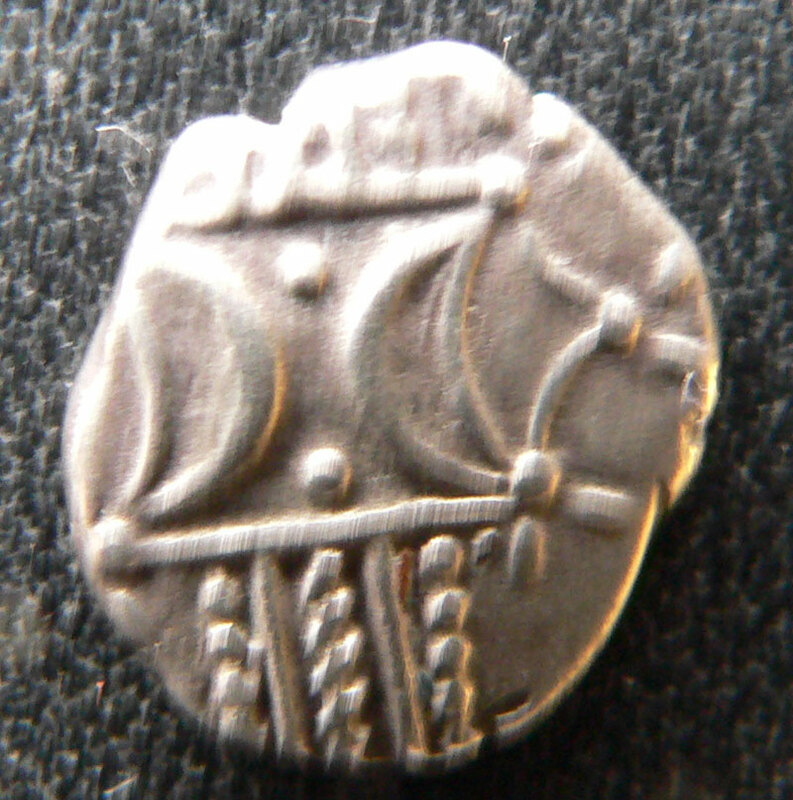 They circulated widely in Norfolk and Suffolk and may be the earliest Iceni silver coins. They feature a well-styled female head with a complex crown on one side and a well modelled horse on the reverse. In Norfolk, the British J coin came about when the horse was replaced by a wolf by the Iceni moneyers. Today this coin type is often called "Norfolk Wolf". The Iceni were to become producers of a vigorous and inventive coinage somewhat isolated from the modernising Romanised tribes further south. c 55 BC Julius Caesar led his first expedition to Britain. The Roman Empire began the conquest of Gaul. Julius Caesar wrote down his experiences in his book on the Gallic Wars, "De Bello Gallico". Many of his comments contribute to our knowledge of the time. He wrote that one of his opponents was King Diviciacus of the Suessiones in Belgic Gaul and that he previously had control over a large area of Britain. This supports the idea of close links between Britain and Belgica around this time. From around 60 BC to 50 BC huge numbers of the coin known as Gallo-Belgic E were struck, with a stylised horse on one side and a blank obverse design. It has been estimated that about 5,000 kg of gold was needed to produce this coinage, almost certainly to pay troops to fight Caesar in Gaul. Large numbers of this coin have been found in Britain, spread from the south coast to the Humber, confirming Caesar's comment that Britain was a base for his enemies in Gaul. 54 BC Caesar's second expedition to Britain resulted in the surrender of the British federation of tribes under the leadership of Cassivelaunus. This man may have been King of the Catuvellauni, who lived north of the Thames. To replace him Caesar installed as King of the Trinovantes a British prince whose father had been killed by Cassivelaunus and Caesar expected an annual tribute in return. The Trinovantes were centred on Colchester and covered South Suffolk, Essex and Cambridgeshire. Although Roman forces left British shores the next hundred years produced large changes in British society. The Belgic culture crossed the Channel into southern Britain along with growing Roman contacts. There was a flowering of celtic arts and an establishment of land division that has partly persisted up to today. Large settlements with earthworks were established. British Celtic coinage sometimes included Latin legends and classical designs, well before the final invasion in 43 AD. 40 BC The Norfolk wolf coinage of the Iceni was replaced somewhere around this time by a group known as the Freckenham type (British N). Various wreaths and patterns with crescent moons occur on one side, with the celtic horse on the other. 35 BC The first inscribed celtic coinage from North of the Thames was produced by Addedomarus who may have been leader of the Trinovantes. 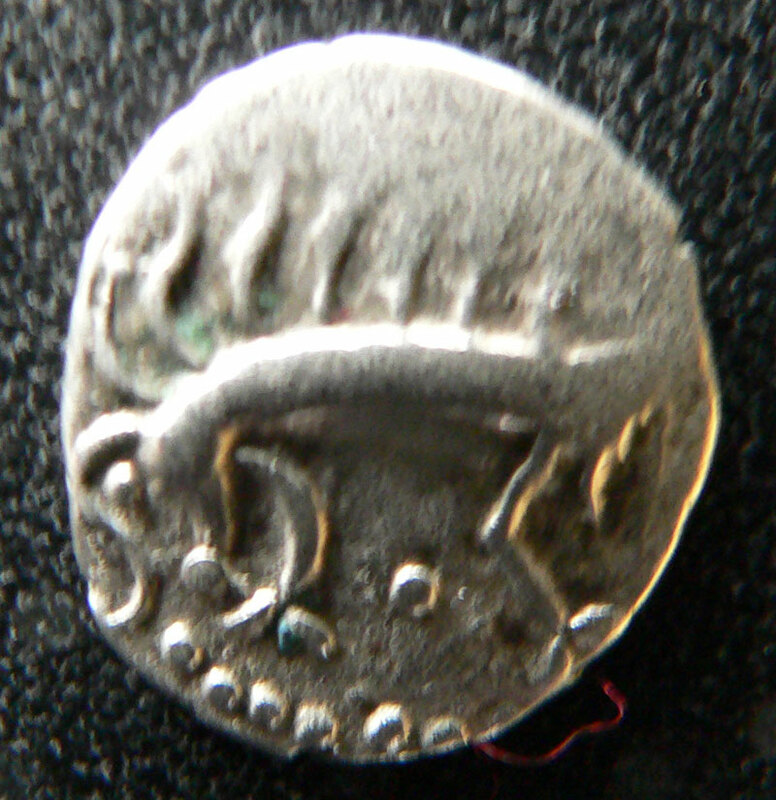 30 BC In Norfolk and North Suffolk, the Iceni coinage now moved on and a stylised boar appeared on one side of silver coins, with a horse on the other. 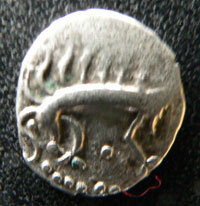 This coin is called the "Norfolk Boar" type. Some have been found inscribed CANM DURO or versions of this inscription. 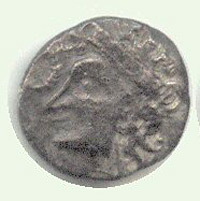 20 BC In Norfolk and North Suffolk, the Iceni coinage contained other variations. 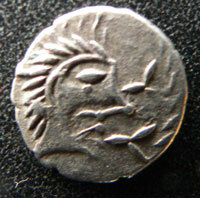 Other Iceni types thought to date from 30 BC to 10 BC are the Face/Horse type. The face has been called the "Norfolk God" type. A variant of this is the "Norfolk God - moustache type". 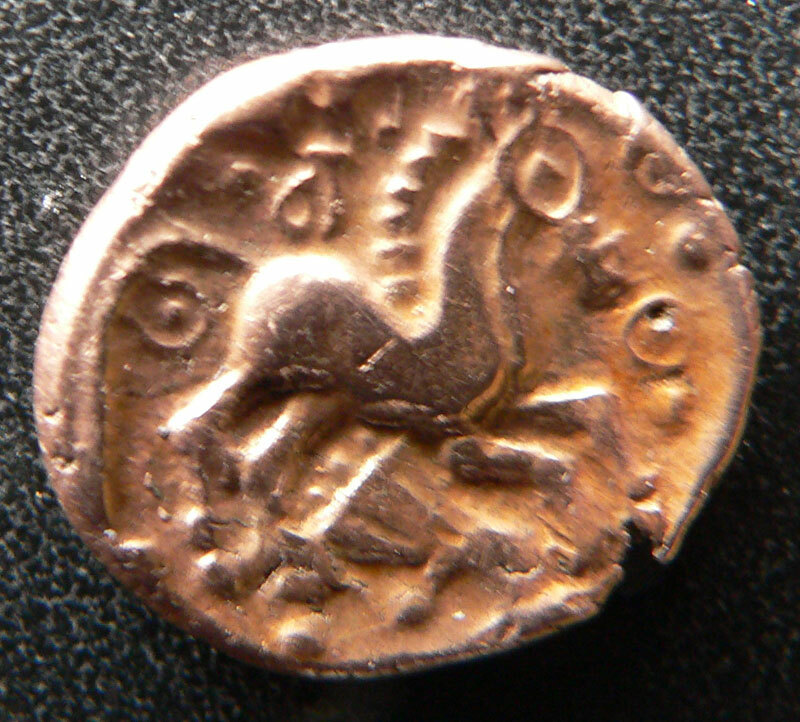 The other side of the coin retains the Horse motif associated with Celtic coinage, and especially with the Iceni. 12 BC The Emperor Augustus launched his armies against Holland and Germany and established a permanent force on the Rhine. Britain exported corn, hides, cattle and iron to the empire to support the Roman military effort and the administrations it set up across the Channel. Britain grew wealthy on this trade and its culture was changed profoundly by this close contact with the Empire. Around this time the Catuvellauni were centred on Hertfordshire, with a mint at St Albans (Verulamium). They seem to have expanded their power and influence over the next 50 years. 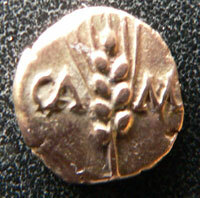 Early coins of Tasciovanus of the Catuvellauni were marked VER or VERL, but a few marked CAM exist. This could refer to Camulodunum or Colchester in the heart of Trinovante territory. However, his later coins dropped the CAM mark. Later, his coins were marked TASCIO RICON, the celtic equivalent of TASCIO REX or King Tasciovanus. There would seem to have been some connection between the two tribes at this time, but it became closer a few years later. 1 AD From about 1 AD to 43 AD, the Iceni continued to produce coins, but inscriptions often now occur. Crescent moons and corn ears or wreaths are on one side and a celtic horse on the other. Inscriptions include ANTEDI, thought to refer to Antedios. Another inscription is ECEN, which some people believe refers to the tribal name, ECENI or Iceni, but if so, this is extremely unusual for the time. c 10 AD Tasciovanus of the Catuvellauni was succeeded by his son, Cunobelin or Cymbeline who ruled them until about 40 AD. Cunobelin is generally considered to have also later ruled the Trinovantes. c.25 AD The Essex and South Suffolk Trinovantes were in some way taken over by the Catuvellaini from the west. Coins show that their new ruler was Cunobelinus or Cunobelin, supposedly later the basis for Shakespeare's Cymbeline. He took over Camulodunum and seems to have moved his main mint and capital from St Albans to Colchester. During his long and powerful rule he issued large numbers of gold, silver and bronze coins of increasingly Romanised designs. About one million of his gold "corn-ear" staters were produced. They have the letters CAMV with an ear of corn on one side and a horse design with CVN on the other. 40 AD Iceni coins inscribed SAENV and AESV are ascribed to this time period. c 41 AD Cunobelin died around this time. Over his 30 years reign, Cunobelin had built up the most powerful kingdom in celtic Britain, extending his influence south of the Thames and also westwards according to Dio Cassius in his "Roman History". Ruling from Colchester after uniting the Catuvellauni and the Trinovantes, he was powerful enough to be referred to as Britannorum rex, or King of the Britons, by Suetonius in his "Lives of the Caesars". He had ruled a vastly greater area than the Catuvellauni had controlled in 55 BC when Julius Caesar first arrived. This expansion and the death of the great Cunobelin may have led the emperor Claudius to consider an invasion. Claudius was only newly made Emperor and badly needed something like a military success to consolidate his position. AD 43 Roman empire coinage circulated widely and profusely in Britain after the Roman invasion of Britain. Much of it was now brass or bronze. Local celtic coins were also still produced. The Iceni uniquely had their tribal name on their coins as ECE (NI) by the first century AD. c 50 AD Under King Prasutagus, the Iceni coinage became romanised. The horse became more realistic and less stylised, the face became a bust rather than a mask. The inscription has been said to read SVB RI PRASTO ESICO FECIT or "under King Prasto, Esico made me". This inscription has recently been called into question. AD 61 The Iceni revolt led to the near overthrow of Roman control and when the Empire regained its grip, the British Celtic coinage was suppressed in the aftermath. During the uprising led by Boudica and in the following Roman suppression, many of the Iceni deposited hoards of coins in the ground for safe-keeping. Over ten hoards have been discovered in Norfolk from this period, and half of them contain mixed Iceni silver units and Roman denarii. The most recent hoard was found at Forncett in Norfolk in 1996 with 381 silver coins of which 336 were Iceni, and 45 were Roman. The Roman coins from the Forncett hoard date from 128 BC through to AD 36 and no doubt the Celtic Iceni coins also span a similar period. These hoards of the Boudican period are clustered in south east Norfolk and the north of Suffolk. There are clusters around Norwich and around Thetford, spreading eastwards along the River Waveney. Around this time fifty gold coins supposedly bearing the head of Prasutagus (Boadicea's husband) were buried on the Chalkstone Hills at Haverhill and were to be discovered by labourers in 1787. 250 Coins made in Britain were allowed again, having been stopped in AD 61. 312 The Roman currency unit of solidus was introduced as one-seventy second of a pound. It was to become the 's' of �.s.d. The denarius was the 'd' of the �.s.d. 411 The supply of Roman coins dwindled and no new coins of the Empire were produced in England. 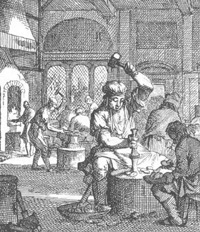 No coinage of any sort seems to have been minted in England from 411 until about 630. The specimens shown are from private collections.